There are two different kinds of organisms that coexist in the contemporary living world: the eukaryotes (more complex organisms with a true nucleus, which include algae, fungi, and protists), and the prokaryotes (simpler organisms without a defined nucleus). Prokaryotes include two microbial groups: the eubacteria (including cyanobacteria: blue-green algae) and the archaebacteria (a heterogeneous group with prokaryotic structure). If we consider the cell structure and function as criteria, there are three groups of cellular organisms: eukaryotes, eubacteria, and the archaebacteria. The eukary-otes can be subdivided into three groups: the plants, animals, and fungi. The eubacteria can be subdivided into purple, green, Gram-positive and Gram-negative eubacteria on the basis of the cell wall. Based on their nutritional requirements, prokaryotes have been categorized as photoautotrophs, photoheterotrophs, chemo-lithoautotrophs, and chemolithoheterotrophs (see Table 1.2). 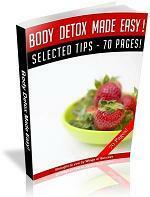 Bacteria can also be classified as being aerobic or anaerobic on the basis of their oxygen metabolism. Prokaryote diversity, however, is not restricted to relationships to molecular oxygen or their ability to capture radiation. Optimal diversity also depends on soil pH, temperatures (cold, ambient, hot), inorganic salts, etc. (Herman et al. 1993; Hurst 2002). Eubacteria are prokaryotic microorganisms that are known to be the dominant group of microorganisms in the various kinds of soil (Visscher et al. 1992; Borneman et al. 1996). They are present in all types of soil, but their population decreases as the depth of soil increases (Wieland et al. 2001). In general, horizon A (soil with organic matter) of a soil profile contains more microorganisms than horizon B (silicate clay minerals plus organic matter) and C (weathered parent material; Bruns and Slatar 1982; Subba Roa 1997). The bacterial forms presents in soil are generally cocci (spheres, 0.5 mm), bacilli (rods, 0.5-0.3 mm) or spirilli (spirals; see Fig. 3.1). Bacilli are common in soil, whereas spirilli are very rare in natural environments (Baudoin et al. 2001, 2002). Bacteria have been classified into two broad categories, autochthonous and zymogenous organisms. Autochthonous or indigenous populations are more uniform and constant in soil, since their nutrition is derived from native soil organic or mineral matter (Arthrobacter and Nocardia; Herman et al. 1993). 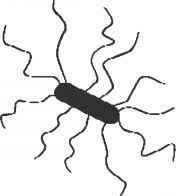 Zymogenous bacteria require an external substrate, and their activity in soils is variable. 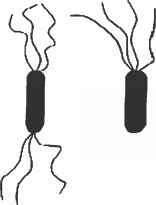 They often produce resting propagules (Pseudomonas and Bacillus). When specific substrates are added to the soil, the number of zymogenous bacteria increases and gradually declines when the added substrate is exhausted (cellulose decomposers, nitrogen-utilizing bacteria, Nitrosomonas, Nitrobacter). Among the ten orders in the class Schizomycetes, three orders, Pseudomonas, Eubacteria and Actinomycetes, contain the species of bacteria that are predominantly reported in the soil (Liesack and Stackebrandt 1992; Benizri et al. 2001). The most common bacteria belong to the genera Pseudomonas, Arthrobacter, Clostridium, Achromobacter, Bacillus, Micrococcus, Flavobacterium, Corynebacterium, Sarcina, Azosprillium, and Mycobacteria (Loper et al. 1985; Lynch 1987a,b). Escherichia is rarely encountered in soils except as a contaminant from sewage, whereas Aerobacter is frequently encountered and is probably a normal inhabitant of certain soils (Subba Roa 1997). Another group of bacteria common in soil is the Myxobacteria belonging to the genera Myxococcus, Chondrococcus, Archangium, Polyangium, Cytophaga, and Sporocytophaga. 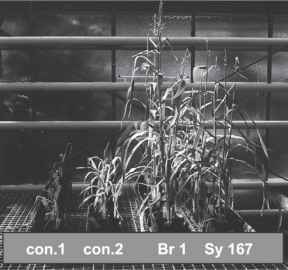 The latter two genera are cellulolytic and so are dominant in cellulose-rich environments (Slater 1988; Benizri et al. 2001). form spores that possess a tough outer covering, facilitating the survival of bacteria in all adverse environments. Based on their temperature tolerance, bacteria can be grouped into mesophiles (15-45°C), psychrophiles (below 10°C) and thermophiles (45-65°C). However, mesophile bacteria constitute the bulk of soil bacteria (Barber and Lynch 1997). Other factors affecting bacterial populations in soils are pH, farm practices, fertilizer and pesticide application, and organic matter amendments (Tate 1987). Autotrophic and heterotrophic bacteria are present in a wide range of soils (Tate 1995). Autotrophic bacteria (purple and green bacteria) synthesize their own organic matter from CO2 or inorganic carbon sources, whereas heterotrophic bacteria depend on preformed organic matter for their nutrition and energy support. Photoautotrophs derive their energy from sunlight, which they catch and transform into chemical energy through bacteriochlorophyll pigment. Chemoautotrophs oxidize inorganic materials in order to derive energy, and obtain carbon from CO2 (Tate 1995). There is a group of bacteria known as the obligate chemoautotrophs. Within this group, Nitrobacter utilizes nitrite and Nitrosomonas ammonium, while Thiobacillus converts inorganic sulfur compounds to sulfate and Ferrobacillus converts ferrous ions to ferric ions (Alexander and Clark 1965; Baudoin et al. 2002). The cyanobacteria are a structurally diverse assembly of Gram-negative eubac-teria characterized by their ability to perform oxygenic photosynthesis. They are considered true prokaryotic microorganisms (Stanier et al. 1986). They have characteristics common to bacteria and algae and are therefore often named "blue-green algae." Cyanobacteria contain a pigment known as phycocyanin, in addition to chlorophyll, which gives these organisms their special blue-green color. The dominant cyanobacteria belong to the genera Chrococcus, Aphanocapsa, Lyngbya, Oscillatoria, Phormidium, Microcoleus, Cylindrospermum, Anabaena, Nostoc, Scytonema, and Fischerella (Subba Roa 1997; Benizri et al. 2002). Some cyanobac-teria also possess heterocysts, which are implicated in nitrogen fixation. Rice fields are a good habitat for the development of certain cyanobacteria that fix atmospheric nitrogen (Prescott et al. 1996). Actinomycetes are soil microorganisms that have sufficient distinctive features to delimit them into a distinct group within the prokaryotes. Actinomycetes are grouped with other bacteria in the class Schizomycetes, but are confined to the order Actinomycetales. 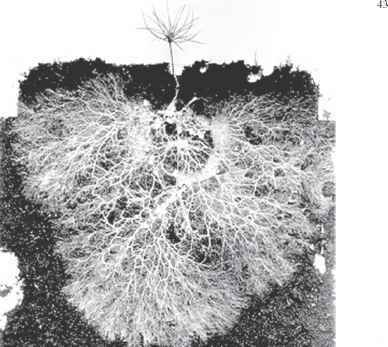 They bear certain similarities to Fungi Imperfecti in the branching of the aerial mycelium, which profusely sporulates, and in the formation of distinct clumps or pellets in liquid cultures (Benson 1988). The number of actinomycetes increases in the presence of decomposing organic matter. They are intolerant of acidity and their numbers decline below pH 5.0. Waterlogged soil is unfavorable to the growth of actinomycetes, whereas desert soils of arid and semiarid zones sustain sizeable populations, probably due to the resistance of spores to desiccation. The percentage of actinomycetes in the total microbial population increases with the depth of soil. Actinomycetes can even be isolated in sufficient numbers from the C horizons (weathered parent material) of soil profiles. The commonest genus of actinomycetes is Streptomyces (nearly 70%). In contrast, Nocardia and Micromonspora, and in particular Actinomyces, Actinoplanes and Streptosporangium, are only encountered occasionally (Prescott et al. 1996; Subba Roa 1997). Temperatures of between 25 and 30°C are conducive to the growth of actinomycetes, although thermophilic cultures growing at 55 and 65°C are common in compost heaps, where they are present in large numbers, and belong mostly to the genera Thermoactinomyces and Streptomyces. The term archaebacteria refers to a group of primitive prokaryotes that are considered to be the first organisms to appear on the Earth, so they are also called the ancient bacteria. They even live in extreme hostile environments, like salt pans, salt marshes, hot sulfur springs, etc. Archaebacteria is a heterogeneous group that is phylogenetically very distant from Eubacteria and possesses distinct characteristics (Table 3.1). These bacteria are characterized by the absence of peptidoglycan in their walls. Instead, their walls contain proteins and noncellulosic polysaccharides. Their cell membranes contain branched chain lipids that enable them to tolerate extreme temperatures and pHs. Their rRNA are also quite different from those of other organisms (DeLong and Pace 2001; Huber et al. 2002). Archaebacteria comprise two subgroups, obligate and facultative anoxybionts. Obligate anoxybionts live exclusively in the absence of oxygen and die in the presence of O2. They include methanogenic and halophilic species. Facultative anoxybionts are found in the presence of oxygen but can live under anaerobic conditions. They are represented by thermoacidophiles (Tate 1995; Barns et al. 1996; Kyrpides and Olsen 1999). Generate methane when they oxidize hydrogen gas as an energy source using CO2 as a terminal electron acceptor. Found near salt lakes, soda lakes, and brines. They produce pigments and can be seen as pink blooms in concentrated saltwater ponds. Found near hydrothermal vents; can grow at temperatures near to 100°C. Obligate anaerobes that use sulfur or sulfate as a terminal electron acceptor, generating hydrogen sulfide. Thermococcus and Archaeoglobus oxidize organic compounds as an energy source; Thermoproteus, Pyrodictium, and Pyrolobus oxidize H2 as an energy source. Oxidize sulfur as a source of energy using O2 as a terminal electron acceptor to generate sulfuric acid. Grow only in extremely hot, acidic environments. most stringent requirements of any anaerobes for the absence of oxygen (<2 ppm), and they require a redox potential of less than -330 mV for growth. Methanogenic bacteria metabolize best at near-neutral pH values, 6.7-8.0. Very low rates of metha-nogenesis, however, have been observed at slightly lower pH values. The cultivation of a methanogen, Methanobacillus, at pH 4 has been reported by a Russian worker, Kuzneceorii (Wolfe and Higgins 1979). Some of the methanogens (Methanopyrus kandleri) are also known to be hyperthermophiles that can grow at 98°C as well as at high salt concentrations, as the formyltransferase from M. kandleri was characterized extensively with respect to thermo- and halophilicity (Shima et al. 2004). Methanogens are ubiquitous in highly reducing habitats. Some of them live as symbionts in the rumen or the first chamber of the stomach in ruminant animals. The most common species of methanogens are Methanobacterium, Methanobrevibacter, Methanococcus, Methanospirillum, and Methanosarcina. Methanogenesis has now been attributed to more than 50 species of bacteria (Jones 1991). Methanogenesis occurs in three steps. First, the decomposition of organic matter in anaerobic environments is performed by bacteria via hydrolysis. This is followed by fermentation, performed by bacteria and some archaea, and methanogenesis, performed exclusively by members of the domain Archaea. Methanogens produce methane by reducing carbon dioxide using hydrogen as an electron donor, or through the cleavage of acetate into methane and carbon dioxide. Large populations of a small and distinctive group of halophiles inhabit highly saline environments (Halococcus and Halobacterium). These archaebacteria live in extremely strong brine or salt solutions, salt beds, and salt marshes. Some halo-philes occur in deep-sea volcanic vents at 100°C; the extreme hydrostatic pressures in these vents mean that water remains liquid at this temperature. In strong light, halophiles develop a purple-pigmented membrane that can absorb solar radiation. The absorbed light is utilized in the synthesis of ATP. These archaebacteria are unique because they carry out their metabolic processes directly using the ATP produced by their pigmented membrane. They cannot convert CO2 to sugar (unlike in photosynthesis). Halophiles growing in salt beds give off an offensive smell and make the salt an undesirable color (Beare et al. 1995; Barns et al. 1996). Thermoacidophiles occur in high-temperature environments, such as hot sulfur springs, where the temperature may be as high as 80°C and the pH as low as 2. These archaebacteria are chemoautotrophic and obtain energy and carbon by oxidizing sulfur while consuming CO2. Under aerobic conditions they oxidize sulfur to sulfuric acid. Some archaebacteria can also reduce sulfur to hydrogen sulfide in the absence of oxygen (Tate 1995; Prescott et al. 1996). Fungi possess the greatest diversity among soil microorganisms (Table 3.2). They possess a filamentous mycelium consisting of individual hyphae, which can be uni-, bi- or multinucleate and nonseptate or septate (Hawksworth 1991b). The quality and quantity of organic matter have a direct impact on fungal flora and populations in soils since fungi are heterotrophic organisms. Fungi can grow in acidic, neutral, or alkaline soils, giving them an advantage over populations of bacteria and actino-myetes, which do not grow in acid soils. Arable soils contain abundant fungi, since they are strictly aerobic and so excess soil moisture decreases their numbers. Fungi exhibit a selective preference for various soil depths. Species common at lower depths are rarely found on the surface. This specific distribution is determined by the availability of organic matter and by the ratio between oxygen and carbon dioxide in the soil's atmosphere at various depths. Multicellular, uninucleate mycelia. Group includes mushrooms, smuts, rusts that affect the food supply. Unicellular and multicellular with septate hyphae. A number of these are human pathogens. Asexual spores develop in sporangia on the tips of aerial hyphae. Sexual spores known as zygospores can remain dominant in adverse environments. Produce basidiospores that are born on club-shaped structures at the tips of the hyphae. Involves the formation of an ascus on specialized hyphae. sexual and asexual methods of reproduction. Phycomycetes possess nonseptate mycelia and produce an undefined number of specialized spore cells called sporangia. In ascomycetes, the sporangium produces a species-specific number of meiotic spores (often four or eight), and different types of active or passive spore extrusion mechanisms are encountered. A higher degree of specialization of the sporangium, known as the basidia, is realized in basidiomycetes. Here, the number of meiotic spores produced is constant (generally four). Fungi, especially asco- and basidimycetes, are able to degrade very complex organic compounds such as cellulose or lignin, but many of them also live as root symbionts (mycorrhizas) and obtain simple sugars from their plant partners (Lynch and Hobbie 1988). Some of the genera of fungi present in soils include Acrostalagmus, Aspergillus, Botrytis, Cephalosporium, Gliocladium, Monilia, Penicillium, Scopulariopsis, Spicaria, Trichoderma, Trichothecium, Verticillium, Alternaria, Cladosporium, Pillularia, Cylindrocarpon and Fusarium, Absidia, Cunninghamella, Mortierella, Mucor, Rhizopus, Zygorynchus, Pythium, Chaetomium, and Rhizoctonia (Newman 1985; Hawksworth 1991a; Subba Roa 1997). Filamentous fungi in soil degrade organic matter and help in soil aggregation. Certain fungi, including Alternaria, Aspergillus, Cladosporium, Dematium, Gliocladium, Helminthosporium, Humicola, and Metarhizium, produce substances similar to humic substance in soil and thus may be important in the maintenance of soil organic matter (Hawksworth 1991b). The rhizosphere is the region of soil that is immediately adjacent to and affected by plant roots. It is a very dynamic environment where plants, soil, microorganisms, nutrients, and water meet and interact. The rhizosphere differs from the bulk soil because of the activities of plant roots and their effect on soil organisms. 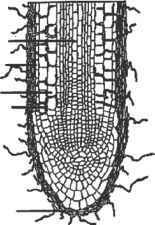 A major characteristic of the rhizosphere is the release of organic compounds into the soil by plant roots. These compounds, called exudates, make the environment of the rhizosphere very different from the environment in the bulk soil. The exudates increase the availability of nutrients in the rhizosphere, and also provide a carbon source for heterotrophic microorganisms. The exudates cause the number of microorganisms to be far greater in the rhizosphere than in the bulk soil. Their presence attracts larger soil organisms that feed on microorganisms, and the concentration of organisms in the rhizosphere can be up to 500 times higher than in the bulk soil. Bacteria are the most numerous organisms in the soil, averaging 106-109 organisms per gram of rhizosphere soil. Due to their small mass, they only account for a small amount of the biomass of soil. Nonsporulating rods, pseudomonads, and actinomycetes are the most common bacteria in rhizosphere soil. Both pathogenic and symbiotic fungi associate with the rhizosphere. They average 105-106 organisms per gram of rhizosphere soil. Zygomycetes and hyphomycetes readily inhabit the rhizosphere because they metabolize simple sugars (Sylvia et al. 2005). The rhizoplane is the root epidermis and outer cortex to which soil particles, bacteria, and fungal hyphae adhere (Singer and Munns 2006; Sylvia et al. 2005). The functional definition of the rhizoplane is the microorganisms and soil particles that remain after the roots have been shaken vigorously in water. There are more microbes in the rhizoplane than in the more loosely associated rhizosphere. This was found by counting the number of colony forming units (CFUs), as determined by spreading extracted soil microorganisms across agar and counting the number of independent clusters of microorganisms. Microbes are most abundant where the integrity of the root is compromised. For this reason, rhizoplane microorganisms tend to be found on older rather than younger roots. Bacteria and fungi that live within the cells of the root are not considered part of the rhizoplane, but are instead called endophytes (Sylvia et al. 2005). Many species of basidiomycetes and ascomycetes as well as most glomeromycetes form tight symbiotic associations with roots of vascular plants and rhizoids of non-vascular plants. This association between the fungal hyphal network and the plant tissues is called a mycorrhizal association (Fig. 3.2). The role of this association is to mediate competition for nutrients between plant species and fungal species. Given the continuously fluctuating nature of the soil environment, the fungus will at times support plant nutrition, while the plant will support the fungus on other occasions. This symbiotic advantage is most evident in times of water or nutrient stress, when a more competitive plant species will act as a source for another individual through the mycorrhizal hyphae. Woody perennial species tend to form ectomycorrhizae with basidiomycetes (and a smaller number of Ascomycetes species). These include beech, birch, larch, oak and pine genera in symbiosis with a variety of Agaricales and Boletales species. Of the 6,000 or more fungal species that form ectomycorrhizae, about 4,500 are epi-geous, while the remainder are hypogeous. It is estimated that about 3% of seed plants form ectomycorrhizae (Fig. 3.3). Ectomycorrhizal association involves the penetration of hyphae between plant cells without intracellular invasion. This network of hyphae within the plant tissues is called the Hartig net. At the periphery of the root, hyphae grow transverse to the root axis in a dense mycelium called the mantle. In mycorrhizae with a reduced mantle and/or more extensive Hartig net, the association is called an ectendomycorrhiza (Fig. 3.3). occur in most vascular and nonvascular plant families. Indeed, most plants are capable of forming arbuscular mycorrhizae. The fungal species responsible are obligate symbionts that cannot be grown without the plant host. They occur in the Archemycota taxa Acaulosporacea (Acaulospora and Entrophosphora), Gigasporacea (Gigaspora and Scutellospra), and Glomacea (Glomus and Sclerocystis). These types of mycorrhizae typically consist of sparse and loose hyphae on the root or rhizoid surface, with most of the mycelium inside the plant tissue or in the soil. The hyphae inside the plant grow between the cell walls, and plant cells are also penetrated. The hyphal cell membrane does not break through the plant cell membrane. Both membranes remain in close apposition even when highly invaginated or ramified. The hyphal extensions into plant cells branch profusely and repeatedly, and resemble a small tree - thus the term "arbuscular." In some cases, the intracellular hyphae grow into a tight coil. 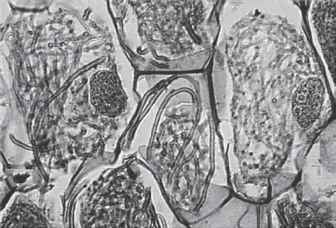 In about 80% of cases, the symbiosis is accompanied by the formation of intracellular "vesicles" inside some plant cells. The vesicle is a terminal hypha that is an intracellular propagule, like an intracellular spore. It contains a reinforced cell wall and storage material (lipid droplets, glycogen and proteins), as do the chlamy-dospores formed in the soil matrix. Three other types of mycorrhizae are recognized. In the Ericales, the roots normally have a few cell layers and are colonized by dense intracellular hyphae. 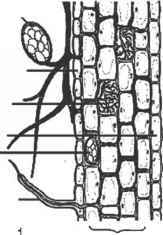 Epidermal cells that are colonized do not form root hairs. Dispersal of some fungal species is by arthroconidia, whereby the hyphae break into nucleated segments by septation. A variant form is observed in some Ericales, notably in Arbutus, called arbutoid mycorrhizae. These are formed by Basidiomycetes species that often form ectomycorrhizae with other plant species. The last two forms of mycorrhizae involve plants that are achlorophyllous for at least a part of their life histories, namely those in the Monotropaceae and Orchidaceae. Both of these rely to a large extent on their mycorrhizae for survival, as they are not capable of generating carbon. The fungus mediates between soil organic matter and a second plant host, transferring organic molecules into the parasitic host. The fungal species are often basidiomycetes that form ectomycorrhizae with other plants, or saprotrophic and parasitic fungal species. Arbuscular mycorrhizal fungi play an indispensable role in upgrading plant growth, vigor and survival by enhancing the nutritive and hydration status of the plant and soil health, by increasing reproductive potential, improving root performance, and by providing a natural defense against invaders, including pests and pathogens. However, the growth of arbuscular mycorrhizae in pure culture in the absence of living host roots is a matter of global concern. Unfortunately, their biotechnological applications cannot currently be exploited to the level they deserve due to their axenically unculturable nature. Scientists from the School of Life Sciences, Jawaharlal Nehru University, New Delhi, have for the first time screened a novel endophytic root-colonizing fungus that mimics the capabilities of a typical arbuscular mycorrhizal fungus, Piriformospora indica. Based on anatomic and genomic studies, P. indica has been classified as a highly evolved species of Hymenomycetes (Basidiomycetes). This fungus has been patented (Varma and Franken 1997) at the European Patent Office, Muenchen, Germany (Patent No. 97121440.8-2105, Nov. 1998), and the culture has been deposited at Braunsweich, Germany (DMS No.11827). The 18S rDNA fragment has been deposited in GenBank, Bethesda, USA. Like arbuscular mycorrhizal (AM) fungi, P. indica functions as bioregulator, biofertilizer and bioprotector, overcoming water stress (dehydration), delaying the wilting of leaves, and prolonging the aging of callus tissues. Interestingly, the host spectrum of P indica is very much like that of AM fungi; it can colonize the roots and improve the health, vigor and survival of a wide range of mono-and dicotyledonous plants (Fig. 3.5). This fungus mediates the uptake of phosphorus from the substratum and its translocation to the host via an energy-dependent active process. It serves as a useful agent for the biological hardening of tissue culture-raised plants, protecting them from "transplantation shock," and leading to almost hundred-percent survival rates in the hosts tested. This fungus is also a potential biological agent against potent root pathogens. Thus, it displays immense potential for use as a biological tool for plant promotion, protection from pests, and for relieving stress conditions, such as those caused by acidity, desiccation, and heavy metal toxicity. Fig. 3.5 P. indica mycelium and its typical pyriform spore form of green scum on the surface of soils, whereas some algae are microscopic. In the soil, algae are not as plentiful as fungi (Metting 1988). 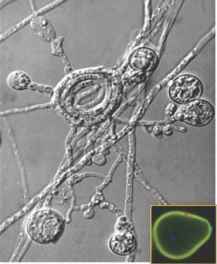 They may be unicellular (Chlamydomonas) or filamentous (Spirogyra, Ulothrix). Algae are photoauto-trophic organisms due to the presence of chlorophyll in their cells. They use CO2 from the atmosphere and produce O2. Algae have also been found below the surface of the soil and beyond the reach of sunlight. However, their numbers are low in these locations compared to those of algae that inhabit the surface of the soil (Metting 1988; Subba Roa 1997). Some of the most common green algae that occur in most soils belong to the genera Chlorella, Chlamydomonas, Chlrococcum, Oedogonium, Chlorochytrium, and Protosiphone (Metting 1988; Lynch 1990). Why soil algae located beyond the reach of sun light ? What are the different types of microorganisms? What are autochthonous and zymogenous soil microorganisms?